We can get a pretty good handle on what types of information are in this screen by looking at the screen itself. While the most basic information is shown directly on this screen, there are several other types of information that are in the tabs toward the bottom of the screen (Patients, Contacts, Identities, etc.). We'll step through all the elements of this screen. Tip: The "Merge" button, as shown above will not appear unless you're logged in as administrator. The information that's shown right on this screen is the basic information. Here we must enter, at a minimum the name of the customer. All other fields are optional, but highly recommended. Tip: In general, if there is a single value associated with a record (like Customer and Name), it will show in the main window. If there can be multiple values associated, then it is a list -- and will appear slightly differently, as some of the information in the tabs. Tip: Your system administrator can configure your system to change the default value of the Title field, or any other pull-down type field. The rest of the information for a customer is housed in the tabs toward the bottom of the screen. We'll discuss each one. Note that we won't put a screenshot of each one in this document, but you're encouraged at this point to click through each tab and get a feel for what information lives in each. The patients tab is a list of patients for the current customer. You can add and remove patients to the current customer here. OpenVPMS is flexible in the way it handles the relationships between patients and customers. It's possible to have multiple owners associated with a single patient, as well as the more typical multiple patients to a single owner. Here, however, we're just showing what patients are associated with this customer. It is also possible to add patients from here. When editing the record, and searching for a patient to add, you can click the "New" button directly from the search box and it will jump to the new patient screen. The details of this are covered further in the Patients section. All different types of contacts are consolidated into this one tab. The screenshot below shows this tab under the customer edit dilaog. Tip: The customer edit button edits the entire customer record, not just the current tab or field. 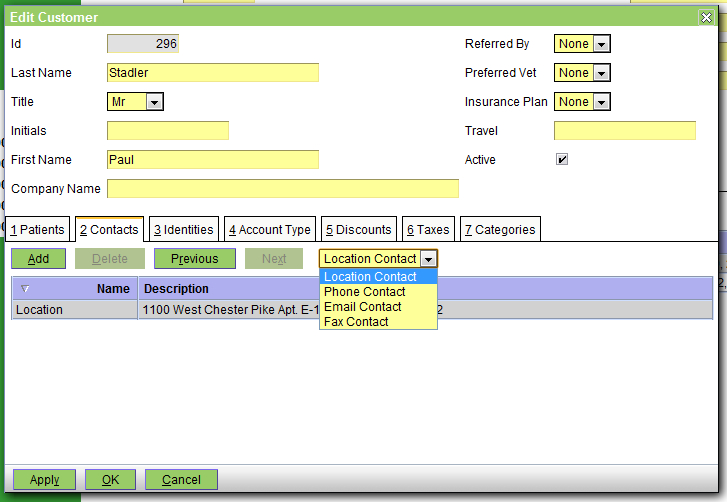 As shown in this field, using the list edit modality (as discussed previously), you can add numerous types of contact information into this list. Contacts consist of Addresses (Location), Phone, Email, and Fax types of contact. Often the system will look for this type of information when printing forms, invoices, or other types of documents. Forms will pull either a) the preferred contact address (there's a checkbox for that), or b) the first contact location the system encounters. For this reason, you must have at least one location and phone contact per customer.